Petrochemicals (also known as petroleum distillates) are chemical products derived from petroleum. Some chemical compounds made from petroleum are also obtained from other fossil fuels, such as coal or natural gas, or renewable sources such as corn, palm fruit or sugar cane. The two most common petrochemical classes are olefins (including ethylene and propylene) and aromatics (including benzene, toluene and xylene isomers). Oil refineries produce olefins and aromatics by fluid catalytic cracking of petroleum fractions. 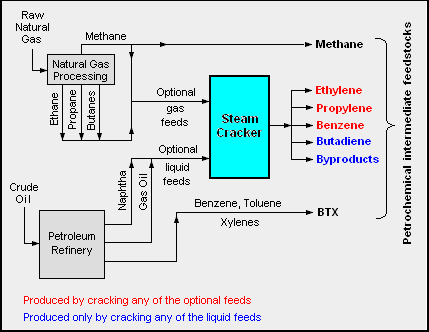 Chemical plants produce olefins by steam cracking of natural gas liquids like ethane and propane. Aromatics are produced by catalytic reforming of naphtha. Olefins and aromatics are the building-blocks for a wide range of materials such as solvents, detergents, and adhesives. Olefins are the basis for polymers and oligomers used in plastics, resins, fibers, elastomers, lubricants, and gels. Global ethylene and propylene production are about 115 million tonnes and 70 million tonnes per annum, respectively. Aromatics production is approximately 70 million tonnes. The largest petrochemical industries are located in the USA and Western Europe; however, major growth in new production capacity is in the Middle East and Asia. There is substantial inter-regional petrochemical trade. Olefins includes Ethene, Propene, Butenes and butadiene. Ethylene and propylene are important sources of industrial chemicals and plastics products. Butadiene is used in making synthetic rubber. Aromatics includes Benzene, toluene and xylenes, as a whole referred to as BTX and primarily obtained from petroleum refineries by extraction from the reformate produced in catalytic reformers using Naphtha obtained from petroleum refineries. Benzene is a raw material for dyes and synthetic detergents, and benzene and toluene for isocyanates MDI and TDI used in making polyurethanes. Manufacturers use xylenes to produce plastics and synthetic fibers. Synthesis gas is a mixture of carbon monoxide and hydrogen used to make ammonia and methanol. Ammonia is used to make the fertilizer urea and methanol is used as a solvent and chemical intermediate. Steam crackers are not to be confused with steam reforming plants used to produce hydrogen and ammonia. Methane, ethane, propane and butanes obtained primarily from natural gas processing plants. In 2007, the amounts of ethylene and propylene produced in steam crackers were about 115 Mt (megatonnes) and 70 Mt, respectively. The output ethylene capacity of large steam crackers ranged up to as much as 1.0 – 1.5 Mt per year. The adjacent diagram schematically depicts the major hydrocarbon sources and processes used in producing petrochemicals. Like commodity chemicals, petrochemicals are made on a very large scale. Petrochemical manufacturing units differ from commodity chemical plants in that they often produce a number of related products. Compare this with specialty chemical and fine chemical manufacture where products are made in discrete batch processes. Petrochemicals are predominantly made in a few manufacturing locations around the world, for example in Jubail & Yanbu Industrial Cities in Saudi Arabia, Texas & Louisiana in the US, in Teesside in the Northeast of England in the United Kingdom, in Rotterdam in the Netherlands, and in Jamnagar & Dahej in Gujarat, India. Not all of the petrochemical or commodity chemical materials produced by the chemical industry are made in one single location but groups of related materials are often made in adjacent manufacturing plants to induce industrial symbiosis as well as material and utility efficiency and other economies of scale. This is known in chemical engineering terminology as integrated manufacturing. Speciality and fine chemical companies are sometimes found in similar manufacturing locations as petrochemicals but, in most cases, they do not need the same level of large scale infrastructure (e.g., pipelines, storage, ports and power, etc.) and therefore can be found in multi-sector business parks. 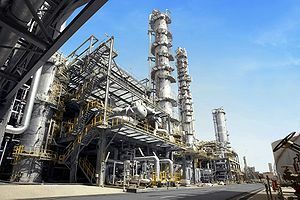 The large scale petrochemical manufacturing locations have clusters of manufacturing units that share utilities and large scale infrastructure such as power stations, storage tanks, port facilities, road and rail terminals. In the United Kingdom for example, there are 4 main locations for such manufacturing: near the River Mersey in Northwest England, on the Humber on the East coast of Yorkshire, in Grangemouth near the Firth of Forth in Scotland and in Teesside as part of the Northeast of England Process Industry Cluster (NEPIC). To demonstrate the clustering and integration, some 50% of the United Kingdom's petrochemical and commodity chemicals are produced by the NEPIC industry cluster companies in Teesside. In 1835, Henri Victor Regnault, a French chemist left vinyl chloride in the sun and found white solid at the bottom of the flask which was polyvinyl chloride. In 1839 Eduard Simon, discovered polystyrene by accident by distilling storax. In 1856, William Henry Perkin discovered the first synthetic dye, Mauveine. In 1888, Friedrich Reinitzer, an Austrian plant scientist observed cholesteryl benzoate had two different melting points. In 1909, Leo Hendrik Baekeland invented bakelite made from phenol and formaldehyde. In 1928 synthetic fuels invented using Fischer-Tropsch process. In 1929, Walter Bock invented synthetic rubber Buna-S which is made up of styrene and butadiene and used to make car tires. In 1933, Otto Röhm polymerized the first acrylic glass methyl methacrylate. In 1935, Michael Perrin invented polyethylene. After World War II, polypropylene was discovered in the early 1950s. In 1937, Wallace Hume Carothers invented nylon. In 1946, he invented Polyester. polyethylene terephthalate (PET) bottles are made from ethylene and paraxylene. In 1938, Otto Bayer invented polyurethane. In 1941, Roy Plunkett invented Teflon. In 1949, Fritz Stastny turned polystyrene into foam. In 1965, Stephanie Kwolek invented Kevlar. alpha-olefins – used as monomers, co-monomers, and other chemical precursors. For example, a small amount of 1-hexene can be copolymerized with ethylene into a more flexible form of polyethylene. adipic acid – a 6-carbon dicarboxylic acid, which can be a precursor used as a co-monomer together with a diamine to form an alternating copolymer form of nylon. polyesters – although there can be many types, polyethylene terephthalate is made from petrochemical products and is very widely used. ^ a b Sami Matar and Lewis F. Hatch (2001). Chemistry of Petrochemical Processes. Gulf Professional Publishing. ISBN 0-88415-315-0. ^ a b Staff (March 2001). "Petrochemical Processes 2001". Hydrocarbon Processing: 71–246. ISSN 0887-0284. ^ "Timeline – Petrochemicals Europe". www.petrochemistry.eu. Retrieved 2018-04-07.